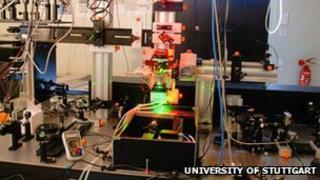 The world's smallest working "steam engine" has been built in Germany, according to a team of researchers. Themicroscopic modelwas based on a 195-year-old design by the inventor Robert Stirling. Changes included the replacement of the original pistons with a laser beam. The physicists said they were "astonished" by how efficiently the machine converted heat into power - but said it did "not run smoothly" and had no practical use in its current form. A conventional Stirling engine has a cylinder of gas attached to a heat source at one end and a cold source at the other. The gas is alternately heated and cooled by being shifted to the different temperature locations. As the gas is heated it expands, driving a piston outwards which drives a wheel. This causes a displacer - also attached to the wheel - to move in the cylinder, shifting the majority of the heated gas to the cool area where it contracts, drawing the piston back in. This moves the displacer back to its original position shifting the gas back to the hot area, and the process repeats. A two cylinder variant of the engine uses two pistons rather than a displacer. "We wanted to understand how such a basic principle works, and if it works at all at a micron-length scale," Prof Clemens Bechinger told the BBC. "Nowadays everybody is trying to make things smaller - electronic circuits and mechanical devices get smaller and smaller - so we thought why not try to investigate this basic process at a micro-scale." The physicists carried out their research at the Max Planck Institute for Intelligent Systems at the University of Stuttgart and published it in the latest edition of the Nature Physics Journal. To adapt the engine down to micro-size, they replaced the cylinder of gas with a single micron-sized particle made of a plastic called melamine, roughly 10,000 times the size of an atom. The particle was submerged in a chamber of water four-thousandths of a millimetre high. The pistons were replaced with a focused infrared laser beam which acted as "optical tweezers", holding the particle in place. The stronger the laser's intensity the more the particle was confined to one spot. The weaker the intensity the more the particle was able to fluctuate around that spot exploring a larger space. The particle thus behaved in a similar way to the molecules in the original heat engine. When the particle was restricted in movement, it resembled the state the molecules would have been in when the gas was compressed. When it was able to move more freely it acted as the molecules would have done when the gas had been able to expand. Since it was impractical to recreate hot and cold heat baths at the micro-level, a second laser was used. It heated the mixture to 90C (194F) in less than 10 milliseconds. It then was allowed to rapidly cool back to room temperature as soon as the laser was turned off. Image caption By replacing pistons with lasers the team claim to have created a "Stirling engine in the microworld"
Although this allowed the physicists to recreate the heat engine process, the amount of energy gained per cycle was not stable. "In contrast to a macroscopic heat engine where everything works in a very smooth and very deterministic fashion, our engine stutters," said Prof Bechinger. He said this was because the water molecules in the solution surrounding the microparticle were constantly colliding into it, causing energy to be passed back and forth. In the larger engine the amount of energy generated by the engine dwarfed that of the tiny collisions happening inside the machine, making them irrelevant. But in the microscopic engine the energy levels were much more similar and could even bring the process to a standstill in extreme cases. Although this made the amount of energy produced per cycle irregular, the team said they were surprised that on average, across a range of cycles, the micro-machine was as efficient as its larger counterpart. "That was something we did not expect when we started the project," said Prof Bechinger. Although the physicists conceded that a mini-steam engine would never be a practical power source, they said they hoped their research could now be used to create more stable power sources for micro-machines.